In October 1993, my 17-year-old daughter Sarah died of an overwhelming allergic reaction after going into a restaurant and eating a slice of lemon meringue pie containing crushed peanuts. Sarah had thought she was only mildly allergic to peanuts and had no idea that an allergic reaction could kill. National newspaper and television reports referred to 'a very rare allergy to peanuts'. But its rarity was challenged by letters which subsequently appeared in a few of the newspapers letters written by the parents of children with nut allergy. What was significant was that these parents had received little medical guidance about their children's allergy they were coping alone. It also became clear there was a similar lack of knowledge and information within the food industry, and manufacturers and retailers had little or no idea that a major issue was about to break. The Anaphylaxis Campaign, of which I am director, was set up early in 1994 following five well-publicised deaths caused by allergic reactions to peanuts or tree nuts. Those who died included my teenage daughter Sarah, whose death was particularly shocking because her previous allergic reactions to nuts had been mild. As a journalist, I had some expertise in gathering information and there were indications early on that, far from being rare, nut allergy was really quite common. Supported by my MP, Cranley Onslow, I set in motion the beginnings of an awareness campaign. However, I was not alone. Following the intense national publicity, several parents of children with nut allergy came forward and we formed the core group of the Anaphylaxis Campaign. As knowledge of the group spread, we found we were overwhelmed with letters from families similarly affected 60-70 per day in the first few weeks. By early 2000, membership stood at around 5500. Members pay 5 a year. In response to the exasperation expressed by members, the Anaphylaxis Campaign has raised the issue on many occasions during discussions with retail companies. We believe there may be some room for manoeuvre. Supermarkets are probably right to discourage people with nut allergies from eating cakes or pastries bought in their in-store bakeries, but they might reduce risk where bread-making is concerned. Managers might look at their operations and consider whether it is possible to dedicate their bread-making area as a nut-free zone. Instead, most of them effectively put in-store bakery products out of bounds for people with severe allergies. I will be returning later to the general problems of cross-contamination and disclaimer labelling. A key question is How likely is it that someone with nut allergy will come across a particle of nut on, say, a spoonful of breakfast cereal that is supposed to be nut-free The answer is that it is probably very unlikely indeed, but it does occasionally happen. A young boy visiting a football match with his grandfather decided at half time to have his usual treat - a milk chocolate bar that he had eaten many times before. He suffered a mild allergic reaction. Looking at the label he saw the warning in small print 'May on rare occasions contain nut traces.' This kind of incident may be rare, but the risks have rung alarm bells in the food industry. An example of a case-control study, is one looking at the aetiology of peanut allergy. It was concluded that children sensitised to peanut had a higher level of peanut exposure in utero due to higher maternal consumption (Frank et al. 1999). This result, which has not been confirmed in cohort studies, probably occurred because of recall bias as the mothers of infants with peanut allergy, are likely to have spent more time considering their consumption of peanuts during pregnancy prior to filling in the study questionnaire. Despite these potential problems, case-control studies represent a rapid way of providing important evidence about a hypothesis that can be later tested using a more definitive approach. Cross-reactivity is due to a reaction to identical or similar protein allergens that occur in more than one food, or in a food and an inhalant pollen. This is different from associated reactivity where two or more food allergens may be seen to be associated epidemiologically. A good example of the latter is the high rate of association between egg and peanut allergy although the allergens are not related. Establishing a cross-reaction requires the demonstration of at least a positive correlation between the magnitude of specific IgE to both foods, and RAST inhibition studies are needed for confirmation. Cross-reactivity is seen at an immunological level when a subject is sensitised to both foods on the basis of positive skinprick or specific IgE testing to both foods. However, often only a smaller proportion will demonstrate clinical cross-reactivity, that is a reaction to both foods on clinical exposure. Retrospective and uncontrolled, but suggested that in an atopic population the consumption of peanuts by mothers during pregnancy and lactation was associated with an earlier onset of peanut allergy in the children. There was no difference in the cumulative incidence of peanut allergy, and timing of immunological sensitisation to peanut was not assessed. An alternative explanation of the data is that the children of mothers consuming peanuts during pregnancy and lactation had the opportunity to consume peanuts earlier in life than those whose mothers did not eat peanuts. Furthermore, the findings of this study are not supported by a study based on the Isle of Wight birth cohort (Tariq et al. 1996). This study showed no effect of reduced no maternal nut ingestion in pregnancy on the development of immunological or clinical reaction to nuts in a non-randomised population followed up until four years of age. Lower quality waste is not added back to products but disposed of in an appropriate manner. Controls must be in place to ensure there is no cross-contamination of allergens when using rework. The simplest rule when handling rework is to put 'like into like' to prevent any risks. Additionally, rework must be clearly labelled for further internal use within the factory and controls must be in place to ensure it is used correctly. 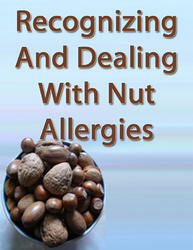 Rework is particularly an issue with regard to nut allergy as trace amounts of an allergen can easily be transferred. Markers of atopy as a whole are associated with an increased risk of developing adverse food reactions. Thus asthma, eczema and rhinitis are increased in children with food allergy compared to the general population (Zeiger and Heller 1995, Hide et al. 1996). The strongest association is between eczema and food allergy, and the risk appears to be greatest in infancy and in those with moderate to severe eczema (Burks et al. 1998, Sampson 1996). The literature appears to be best for peanut allergy. One study found that in peanut-allergic children atopy in some other form was present in up to 96 of subjects (Ewan 1996). In the Isle of Wight birth cohort study half of the children with peanut allergy had asthma and two-thirds had eczema, considerably higher than the rates in the cohort as a whole (Tariq et al. 1996). A family history of food allergy in a first-degree relative increases the risk of food allergy approximately fourfold in other family members (Dean 1997). In families with at least two food allergic individuals, the same food is frequently implicated. The best-studied food is peanut whereby if one sibling has peanut allergy then the risk of another sibling having peanut allergy is 7 . This represents a tenfold increased risk compared with the general population in whom the risk is 0.6 (Tariq et al. 1996). However, there is a lack of good literature looking at the risk for other foods and in general there are no studies, such as twin studies, that separate the role of genetic and environmental factors in the development of food allergy. A number of different HLA genotypes have been shown to be associated with different types of food allergy. The data are best for peanut allergy and coeliac disease (Howell et al. 1998, Howdle and Blair 1992).